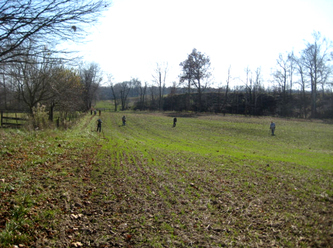 Sunday, November 8th provided a beautiful day for the second Dayton Diggers group hunt. It was organized at the farm of Scott Amos in Highland County by Manny Carillo and Steve Greene. 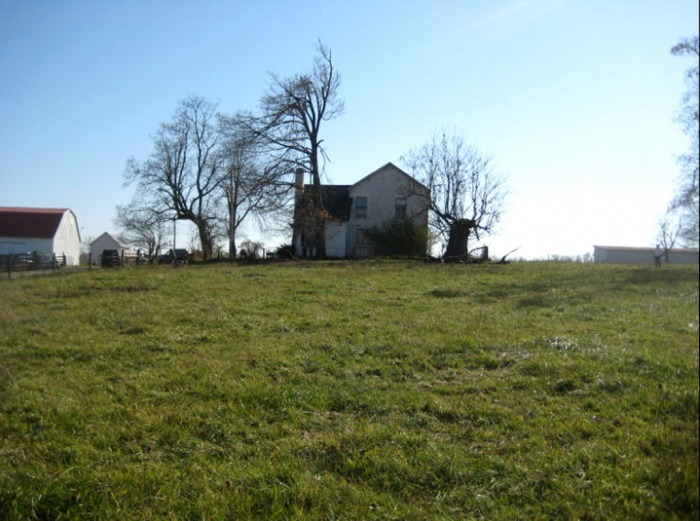 The farm had a older brick home with Victorian gingerbread trim, and was reportedly the site of a one room schoolhouse, and perhaps another homesite. 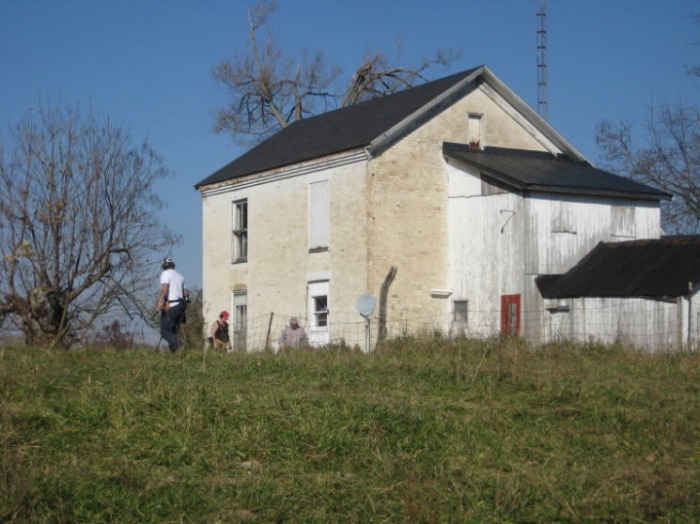 Research showed the home on the 1871 plat map and another structure in the vicinity, possibly a home, now gone. 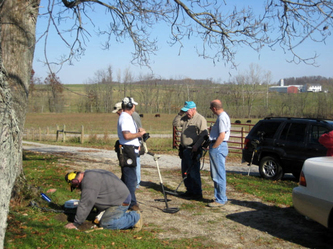 Twelve eager detectorists showed up to try their luck. Several new members were present, Cindy Carver, Carol Bartley and Jeff Landis. Other members present were: myself, Steve Greene, Manny Carillo, Bill Baecker, Terry Everly, Mark Ferguson, Doug Schilling, Tony Mantia, and Bob Brigeman. It was great see faces new and known and swap some stories. Most of the activity centered around the old farmhouse. One of the first finds of the day turned out to be the best. 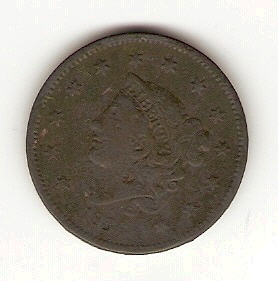 Mark Ferguson (below) dug a nice 1836 large cent using his Minelab Explorer! 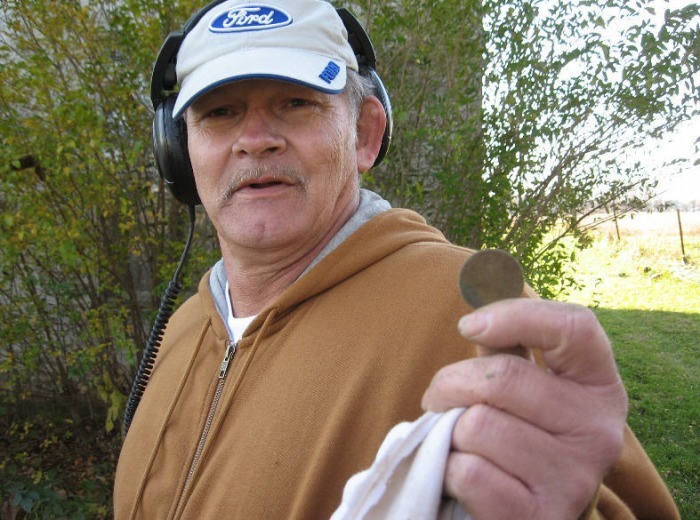 While others were finding some wheat cents and modern coins, Terry Everly turned up a lead soldier, some other relics and then two Mercury dimes in one hole. Manny Carrillo (above) was detecting an area others had been over before when his White’s Classic ID gave him a soft signal he couldn’t pass up. It turned out to be a worn 1919 Mercury dime. 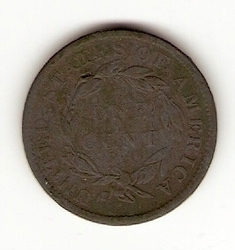 After making his recovery, he rescanned the area and dug another faint signal and was rewarded with a wheat cent. Manny, Bill, Steve and I wandered over in the tall grass of the hilly pasture to the left of the house. Not the easiest spot to be detecting, but amidst the cow pies, Steve found an old aluminum Kirk Soap Company token advertising Cheerio soap. Jeff Landis also dug a soap token, his was for Palmolive soap and was also aluminum but octagonal-shaped. Taking a break, Terry pulled out a number of display cases from his truck, showing off some of his best finds. Really great stuff to see, and it certainly helped keep us motivated! I distributed copies of the Diggers Gazette and Ohio Metal Detecting magazine. While Steve and some others went to find some pizza to bring back for lunch, the remaining detectorists headed over to a newly planted spelt field where we suspected an old homesite may have been. After fording the creek and for some of us, fence climbing, we got our coils to the ground. I was hopeful when I picked up a broken piece of an old aqua colored bottle with a hand blown open pontil mark on it. The open pontil is generally pre-1855, so that got my hopes up that there might be some more relics of that era in the field. However it was not to be. The few items I recovered dated to the 1940s. No traces of a homesite were discovered in the field. I also found a 1960s aluminum Shell President Game token that had been shot. Our disappointment in the spelt field was alleviated by the call of lunch. We found our way back to the farmhouse over the fence and through the creek, some via the helpful aid of Scott’s ATV, to socialize and take a break. 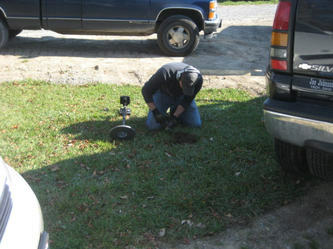 After lunch we continued to pound the area around the farmhouse as that had been the most productive. 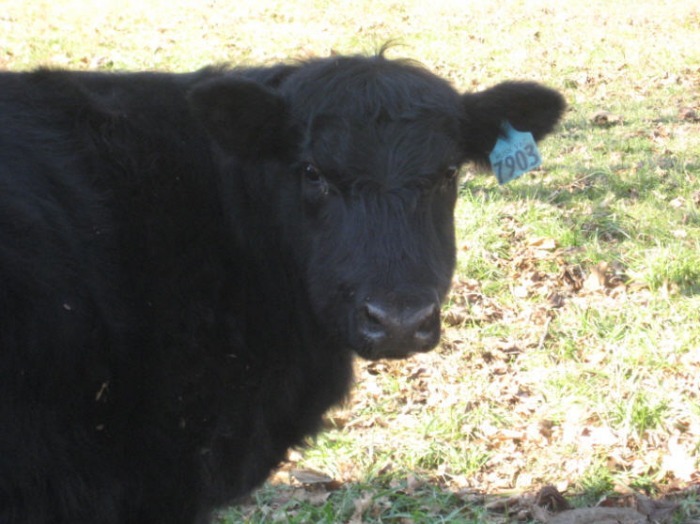 Steve, Mark and I tried our luck in the pasture in front of the house trusting the three docile black cows there would not bother us. The best I could come up with out of that area was a 1956 dog license, which bested my previous oldest dog license, a 1957, and I know Steve dug at least a Memorial cent there. The beautiful weather and great company could not make up for the waning enthusiasm that came with the lack of more finds. As the afternoon wore on, tired detectorists packed up and headed home. As the detectorists were leaving, two non-detecting Dayton Diggers, Chuck Cannon and Greg Gromosiak, showed up to walk the woodline of the property to see if any old bottle or can dumps could be located. I heard later that while they tried, Chuck, Greg and Steve were not able to discover the location of any possible dump sites there. All in all the Diggers gave this property a really thorough searching and everyone had a great time.